State House, Freetown, Wednesday 2 August 2018 – His Excellency President Julius Maada Bio has met with representatives of the African Court on Human and People’s Right, who are in Sierra Leone on a sensitisation mission. President of the Court, Honourable Judge Sylvain Oré, expressed gratitude for the audience, noting that the election of President Bio showed that democracy in Sierra Leone was growing. He mentioned that one of the major objectives of the court was the protection of human rights on the continent, adding that: “the visit is to explain the role of the Court and to plead with President Bio to ratify the protocol and make the declaration to allow individuals to seek redress in the court in terms of protection of human rights in Africa”. The Ivorian judge also said that 30 other Africa countries had already ratified the protocol to the court while eight others had already made declarations that would allow individuals to seek redress in the court. He stated that the African Court was a continental court and an institution in the framework of the African Union that is concerned with the protection of human rights across Africa. 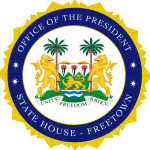 President Bio, on behalf of the people of Sierra Leone, welcomed the mission and informed the team that although his government hadn’t enough time to look into issues relating to the ratification and declaration of the court, he would use the opportunity to thank the team for their efforts at strengthening human and people’s rights across Africa. “We are new in office but our commitment to human rights is very strong and you can be rest assured that we will give this particular issue a positive consideration. We will look at it and consider the ratification and the declaration. My government will look into the issues and take positive measures about them,” he ended. The Court was established by virtue of Article 1 of the Protocol to the African Charter on Human and Peoples’ Rights on the Establishment of an African Court on Human and Peoples’ Rights (the Protocol), which was adopted by Member States of the then Organization of African Unity (OAU) in Ouagadougou, Burkina Faso, in June 1998. The Protocol came into force on 25 January 2004 after it was ratified by more than 15 countries.